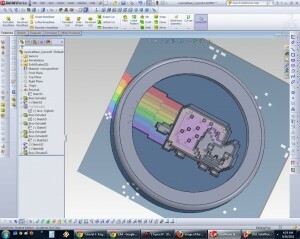 I’m embarrassed to say how many hours I’ve wasted CADing nyancat paperweight for 2.008 now. 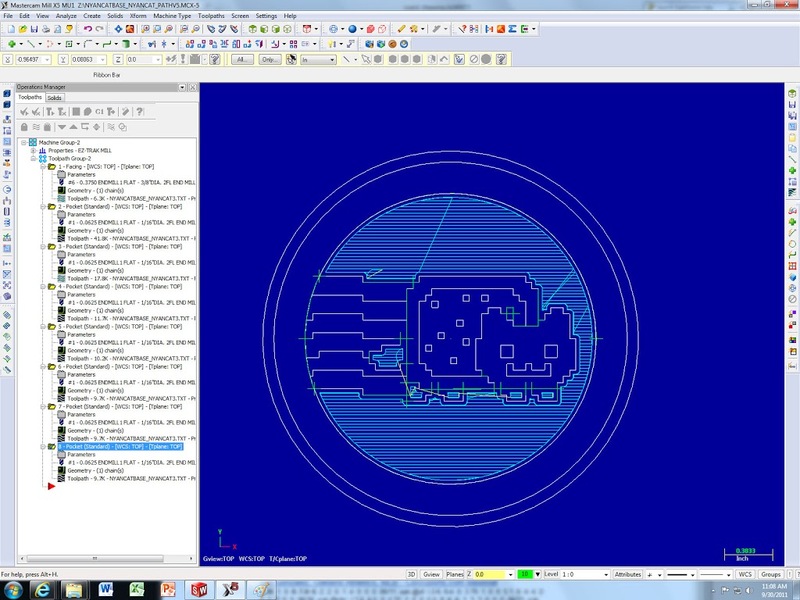 Aha, so I realized (thanks to Steve, shop instructor extraordinaire) that there are many things wrong with my CAD. 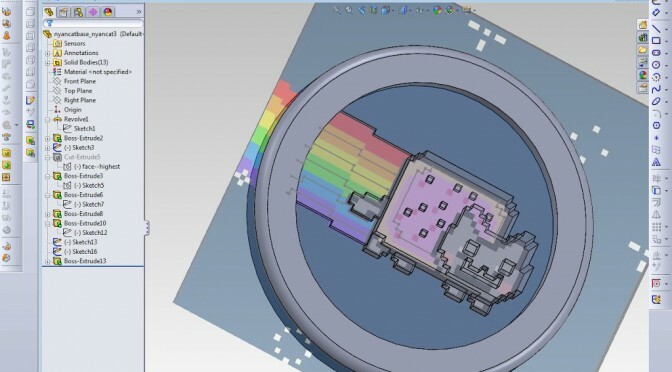 Sadly, I chose 5 mils spacing for the grid I used to trace nyancat. Turns out our smallest drill bit is 1/16” ( over 6 mils). Eheh. Also, I was planning on going 0.3” deep, which would take forever to mill out using 1/16”, as it can only go ~0.02” down per z-axis pass. that, dear friends, is the look of a lot of milling time. I was halfway through the infuriating MASTERCAM too. Lesson learned: avoid branching as much as possible. See that right-most sprinkle that touches the cat’s head? Caused me no end of trouble! Next step? Infinite Mastercam’ing. 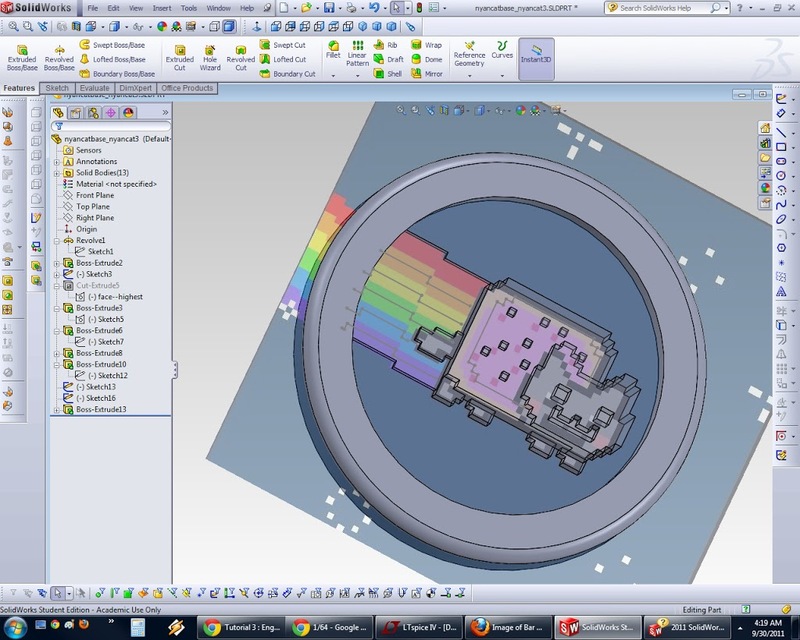 Instead of being a nice cavity with extruded nyancat, it’ll probably end up being closer to pedestal with a nyancat on top done in thin layers. I’ll also use a larger diameter tool to pocket out each shape and then contour with the 1/16”. 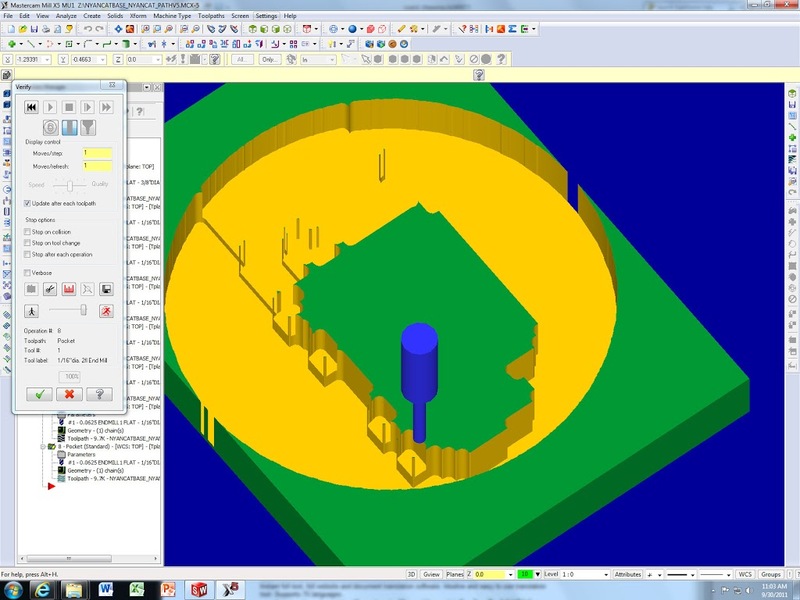 So, first up, redo solidworks using 0.7” grid spacing (resize reference picture accordingly — btw, found under insert > sketch tools > sketch picture). I’ll stick the files up on github sometime soon. Saturday: Get ISP and PoV working, 6.131 lab writeup, MITERS misc. (project grants / safety / update website), PoV with partner 10am, Theater scene practice 2pm. Apply to summer jobs. Monday morning: lasercut cookies, document cookies and ISP.